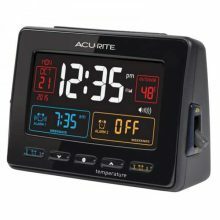 The AcuRite Atomic Dual Alarm Clock features an illuminated color display with outdoor and indoor temperature, atomic clock and calendar, and two alarms. 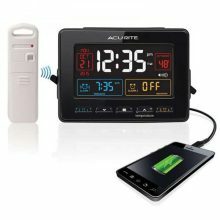 Offers the convenience of USB charging for compatible smartphones. The dual, programmable alarms can be set for everyday use, weekdays or weekends only. Atomic clock is radio-controlled to synchronize to the correct time broadcast by the National Institute of Standards and Technology (NIST) Radio Station, WWVB, for split-second precision accuracy. The clock automatically adjusts itself for Daylight Saving Time (DST). The outdoor sensor features powerful wireless technology, weather-resistant construction and an integrated hanger for easy mounting. One-year limited warranty. It’s more than accurate, it’s AcuRite. Plan the day with confidence with your own weather prediction information – pinpoint accuracy right from your own backyard. 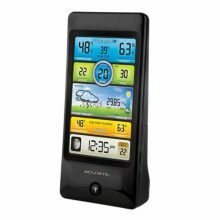 The AcuRite Pro Weather Center uses patented Self-Calibrating Technology to provide your personal forecast of 12 to 24 hour weather conditions. Self-Calibrating Forecasting is generated from weather data measured by a sensor in your yard – giving you the most accurate forecast available for your exact location. The weather station’s illuminated color display features indoor / outdoor temperature and humidity, wind speed, wind chill, dew point, heat index, barometric pressure, moon phase, Intelli-Time clock and calendar. Wind information includes current wind speed, average wind speed and peak wind speed readings that are tracked and updated every 18 seconds. Intelli-Time clock automatically adjusts for Daylight Saving Time (DST). Humidity level indicator easily conveys a low, high or ideal indoor humidity level. Display stands upright for tabletop use. 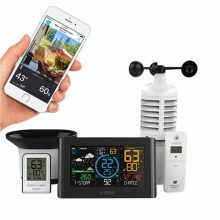 The patent-pending 3-in-1 wireless weather sensor features 3 different technologies in one easy-to-mount unit: thermometer, hygrometer, wind speed anemometer. It is easy to setup, includes mounting hardware, and features a 2-year battery life for maintenance-free operation. One-year limited warranty. It’s more than accurate, it’s AcuRite. Predicting the weather is an inexact science, and not all of us are meteorologists. 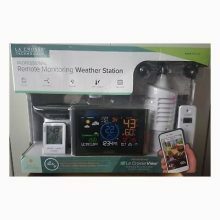 To get better, accurate weather information, check out the La Crosse Professional Remote Monitoring Weather Station. You’ll be getting constant weather updates, notifications, and warnings. This is great for those of you who live in certain parts of the country where storms and rain can come and go quickly without warning. You definitely don’t want to get caught off guard wearing the wrong clothing when you leave the house in the morning. 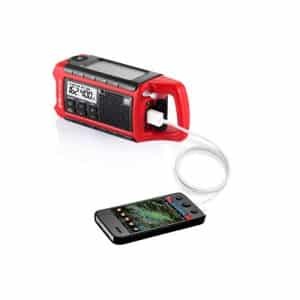 Portability is important in when preparing for severe weather season making the EH55VP popular option for those who are constantly on-the-go. 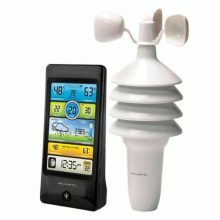 The EH55VP lets you select your weather channel at home and scan channels while traveling. 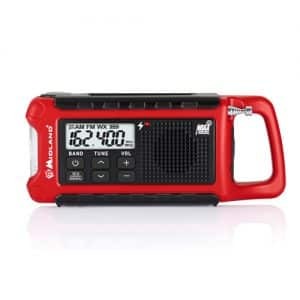 This compact emergency crank radio with weather alert is perfect for both emergency preparedness and everyday use. 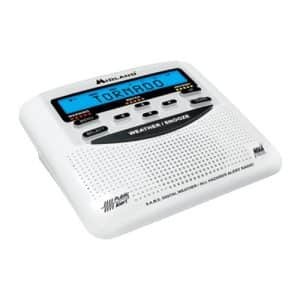 The gold standard of NOAA Weather Radios. The WR120 features S.A.M.E. 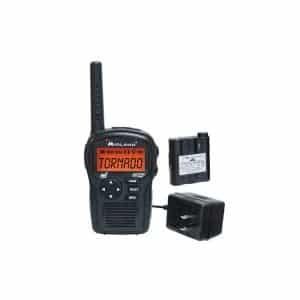 localized programming and alerts you to over 60 kinds of weather hazards and emergencies. When a severe weather watch or warning is issued by the National Weather Service, the WR120 automatically alerts you, giving you the seconds you need to seek shelter.